Supporters of a feature length documentary on New Zealand’s War Horses of World War 1 are pressing on with the project despite missing a crowdfunding target. The Anzac Horse appeal aimed to raise $5000 on Boosted.org.nz to go toward production costs, and while the project didn’t meet its target, several of the refunded pledges had already been returned to the producers by supporters wanting to see the project through to fruition. New Zealand war horse Bess. The film Anzac Horse, by award-winning director Julian McCarthy, is about the New Zealand Mounted Rifles who went to World War 1, taking their own horses. The story has particular focus on the Canterbury Mounted Rifles but will include all the Mounted Rifle Brigades from New Zealand in WW1. “The Mounted Rifles were a unique and brave group of men and horses. They were not a cavalry. As the saying goes, ‘the Cavalry only ride forth when the echo of machine guns has ceased’,” producers say. They aim to take the documentary to the New Zealand Film festival, and a TV cut is also being made for national and international TV channels. “It was the New Zealand Mounted Rifles, along with the Australian Light Horses that were the ones to ride first into a battle zone, close to (and sometimes across) enemy lines. Man and horse did this together, through machinegun and shell fire. Dismounting, they would begin battle, to hold position, fighting valiantly til relief from the slower-moving foot soldiers could reach them. 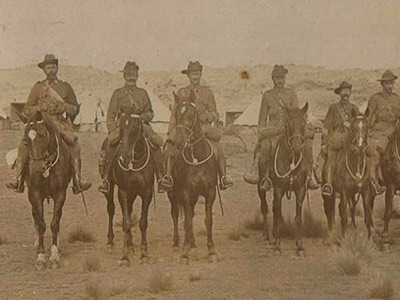 The allied Sinai and Palestine Campaign owes much of its success to these men and horses. “We believe this is a story that needs to be told, to honour the men and the horses of Canterbury, and New Zealand as a country. Their place in history will soon be lost forever, as their descendants and the untold stories that they carry with them slowly leave us. Little attention has been given to the New Zealand men and their horses in the Sinai and Palestine campaigns. Their story of survival, bravery and triumph in the harshest of conditions of the desert, is sorely absent from our history books and film. “Many horse and riders fell in World War One. The suffering of soldiers is, to some extent known, but the horses faced particular sufferings too – with extended sea travel, sea sickness, lack of food and water, exhaustion, skin diseases, brutal wounds and harsh climates. The reference to the horse getting sea sick is misleading. Horses do not get sea sick. I have for the last 3 years been transporting horses by sea to many parts of the world and have never had sea sick horse to deal with.If you are going to be factual a least be correct. Great project all the same. Thanks for your input Robbie, and apologies for the long wait on a reply. Our use of the term ‘seasickness’ was perhaps a ‘loose’ use of the term, but a couple of things that can be said : a significant number of horses died on those ships while being transported, -it is difficult to say whether this was due to overcrowding / ‘horse to horse’ passing on of disease due to poor ventilation / lack of exercise / poor feed, – or anything else. No doubt the ships that your horses are transported in, have more adequate and appropriate ventilation, and far superior stabilisation measures, than the ships used by the military 100 years ago. This documentary is still in production, and we don’t have much filming left to do, – we have had very little in the way of funding so far, but have continued to film and record the individuals connected and /or affected in some way by the taking of the horses to war in World War One. We are confident that this film will do justice to those people and horses that were involved in that war.